OSU researchers investigate plants that create the healthiest environment for school communities. 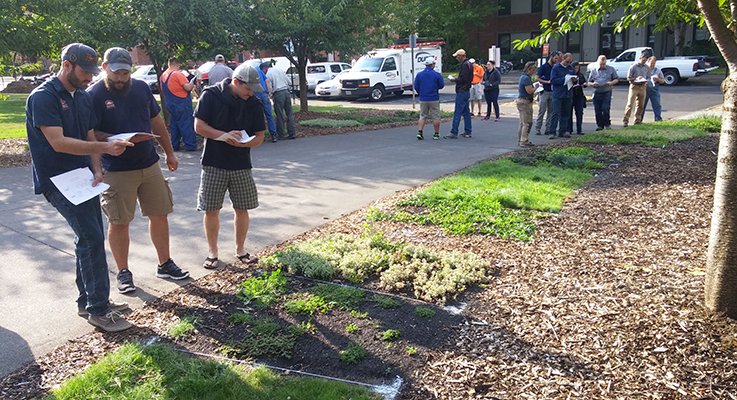 IPM coordinators and school grounds employees rate the plants during an IPM Coordinators Training at OSU’s main campus in Corvallis, Oregon. Oregon’s school integrated pest management (IPM) law became effective in July of 2012. This law requires K-12 school districts to implement an IPM plan including pest monitoring, inspections, staff education and designation of an IPM coordinator who is required to attend six hours of IPM training per year. The OSU School IPM Program, which ensures the IPM law is carried out, helps create IPM plans for school districts and holds roughly 30 IPM coordinator training sessions annually. The goal is to create a healthier environment for school communities (including students, staff, and parents) via reduction in pests, pesticide use, and pest management costs. This can be accomplished if pests on school grounds can be effectively managed, and if pesticide applicators enhance their management tactics and strategies in combination with the use of low-impact pesticides. In addition to holding training events all over Oregon, the OSU IPM Program holds its own training event on Oregon State University campus in Corvallis to promote well-rounded IPM practices. At this event, a demonstration plot is used to support turf and landscape training. This demonstration plot just happens to be a master’s project for one of the authors (Micah Gould). The project evaluates ground cover plants that might be able to reduce pesticide needs, as well as maintenance requirements, for schools in the future. Partial funding for this project was provided by a grant from the USDA National Institute of Food and Agriculture. For this project, several stakeholders developed a preliminary list of about 30 plants. These stakeholders included public school grounds staff and IPM coordinators, OSU horticulture professors and extension educators, and landscape professionals. Once this preliminary list was produced, an IPM training event for the Portland Metro School Grounds Employees took place in February 2015 at Sandy High School in Sandy, Oregon. There, stakeholders in the OSU IPM Program, comprised of school grounds staff and IPM coordinators, narrowed the list down to 10 plants. The 10 plants, located at Oregon State University and duplicated at the OSU Lewis Brown Horticulture Farm in Corvallis, Oregon, include three grasses and seven herbaceous ground covers. The grasses include Chewing’s fescue (Festuca rubra L. ssp. commutata), strong creeping red fescue (Festuca rubra L. ssp. Rubra Gaudin) and colonial bentgrass (Agrostis capillaris L.). The other ground covers in the study consist of: Caucasian stonecrop (Sedum spurium), wintercreeper (Euonymus fortunei ‘Kewensis’), creeping juniper (Juniperus horizontalis ‘Blue Chip’), green carpet (Herniaria glabra), dwarf periwinkle (Vinca minor), bearberry cotoneaster (Cotoneaster dammeri) and Point Reyes ceanothus (Ceanothus gloriosus ‘Point Reyes’). What do these plants all have in common? A wise horticulturalist would tell you that these plants all have low growing habits. The stakeholders not only selected these plants, but they also gave us the maintenance practices to perform on them during the trial. Since school grounds workers are often limited by time and budgetary constraints, it appeared low-maintenance or even no-maintenance practices would be the answer. The majority consensus preferred to use plants that required no maintenance, while others preferred plants that tolerate mowing, just as they do to the grasses on their property. As a result, we split our experimental plots into a mowed side and a no-mow side. To satisfy the “no maintenance” consensus, we split all of the plots once again into a high-maintenance side (to be weeded every other month with two annual fertilizations) and a no-maintenance side (with no weeding and only an initial fertilization). This might be a bit confusing, so Figure 1 shows how each plot is divided. These two maintenance levels reflect the amount of work the vast majority of public school grounds employees actually are able to perform throughout any given year on a typical landscape. If two annual fertilizations a year are deemed “high maintenance,” especially in a turf landscape, then one can assume these employees are being stretched thin through budget cuts. At that point, landscape aesthetics must take a backseat to the safety of the children and staff. The IPM plots were planted in March 2015, with data first being taken that May. We collected data once a month, but only on the low-maintenance sides. The high-maintenance sides were given roughly a year to become established. Maintenance was then discontinued in these plots, after which we began to collect data. We collected a variety of data on these plots to tell a story of what is going on with these ground covers. The list of metrics included the following: soil moisture content, photosynthetically active radiation (light) at the desired plant’s surface, visual aesthetics, percent plant coverage, and percent weed coverage. After data analysis, differences in plant coverage percentage and weed cover percentage were observed. From May 2015 to January 2016, colonial bentgrass, Chewing’s fescue, and strong red fescue had the highest percentage of plant coverage among all ground covers (83 percent, 76 percent and 74 percent, respectively) (Table 1). The plant with the next greatest coverage was Sedum spurium, which provided 51.8 percent ground coverage. From there the plants dropped off in plant coverage, and increased in weed coverage. When looking at weed percent coverage, we saw what one would expect — if there are no plants occupying the soil, weeds will emerge from the seed bank. In order of lowest weed coverage, the list is nearly identical, with the exception of a few plants. The grasses again are at the top of the list, followed by Sedum. This relationship between plant coverage and weed coverage is explained pretty easily. If you have high plant coverage, there will not be as much room for weeds to access the sunlight they need to grow. Inversely, if you have low plant coverage, there will leave more space for weeds to occupy. No significant difference between soil moisture content and the photosynthetically active radiation at the plant surface was observed. In a short period of time, we observed that grasses fill in areas quickly, reducing weed coverage better than the other ground covers. Sedum performed almost as well as the grasses, but it comes at a substantially greater cost per area compared to grass seed. Ground covers have the potential to get complete coverage resulting in fewer weeds and lower long-term maintenance costs, but there is more of an up-front cost in maintaining them until full establishment. Grasses are great in that they fill in fast while being relatively cheap, but long-term maintenance requirements will be greater, considering the need for regular irrigation, fertilization, and mowing. These demonstration plots are going to be a good teaching tool showing the landscape conditions one might expect with lower maintenance regimes. Whether school grounds employees or other users decide to plant grasses or other herbaceous ground covers in the landscape, a site-by-site approach will apply. Eliminating hard-to-mow or hard-to-irrigate grass spaces with other drought-tolerant, low-nutrient-requirement ground covers will save time and money in the long run. The same can be said about large areas that require high maintenance or pose a threat to children’s safety due to lurking predators, which could be averted by installing turf. Making the decision of which plants to install depends on the level of commitment to the up-front cost, the long-term budget, and the general function the plants will play a part of through a specific site analysis. We all want good-looking landscapes. The trick is to make them look decent while fulfilling a purpose, and do so with a tight budget at hand. This demonstration plot is only a snapshot of the possibilities of what school grounds employees might employ in their landscapes, but we hope it can help schools in Oregon get a sense of other options on the table to lower costs while using fewer pesticides in creating a healthier learning environment.